The question on the audience’s lips seemed to be “where is everyone?” Disney Hall was as empty as I had seen it for an orchestral concert. The entire Orchestra View section was empty (save four people) and there were plenty of seats to be had in the rest of the sections. It was a puzzlement given the “one night only” occasion this concert provided with the LA Phil’s conductor laureate. In any case, the performers made an event of this performance, as expected, delivering a shattering, expertly executed performance of Berg’s Wozzeck. At this point it is cliché to say that a concert performance of an opera helps minimize the distraction of fussy, non-sensical productions. In the case of Tuesday night’s performance this was absolutely the case. Naturally, there were times when a concert staging was not as effective (as in Marie’s murder and Wozzeck’s drowning), but for the most part these remarkable singing actors focused the drama so acutely on their characters that the tension in the hall was almost unbearable. Johan Reuter led the way as the tormented simpleton Wozzeck. Aside from his secure, brutish, but lyrically pleasing baritone voice, Reuter physically inhabited his character in every aspect with awesome abandon. His walk was tortured, his posture subservient, and his expressions ran the gamut from terrifying to heart-breaking. When Wozzeck murders Marie, we finally saw a man in complete control of his circumstances and actions. It was a wholly convincing transformation. In Angela Denoke’s Marie, Reuter had an equally dramatic costar. Known for her specialization in 20th century opera, Denoke’s reputation is well-deserved. While her mannered technique is occasionally distracting, her dramatic instincts are impeccable and her sheer ability to elicit sympathy and fear from the audience served Marie quite well. Her seduction by the smarmy Drum Major was raw in both her resistance and acquiescence. Denoke’s torment in the first scene of the Third Act was palpable. Her confrontation with Wozzeck was one of those moments where opera reached its zenith in all facets. As focused on the title character as this piece is, the supporting cast provides so much of the dramatic motivation for the story that without convincing singers, a performance could be treacherous. Thankfully, the entire cast, down to Harry Nicoll as the Idiot, was in complete control vocally and dramatically. Peter Hoare as the captain was the standout, providing an irritating foil for Wozzeck. Hoare’s physical antics and piercing tenor voice were enough to drive anyone to madness. Kevin Burdette’s last-minute substitution for an ill Tijl Faveyts was not a detriment and, despite being the only singer to use a score, he was confident in his part with a thunderous bass voice and condescending demeanor. Hubert Francis as the lecherous Drum Major was dressed to the nines in a white tie and oozed arrogant carnality from every pore. Joshua Ellicott as Andres was occasionally overpowered by the other singers, but portrayed a sympathetic character. Henry Waddington’s warm and ample bass voice was a nice addition as the First Apprentice. Anna Burford as Margret sang with a uniquely-low alto voice, providing base sensuality to the character, particularly in the tavern scene. Despite being sung to several times throughout the opera, Zachary Mamis as Marie’s Child appeared only in the final scene for his few devastating vocal lines. Esa-Pekka Salonen and the Philharmonia Orchestra did well in programming this piece for their North American tour. Besides being one of the most compelling 20th Century operas, it is such a showcase for the orchestra. The Philharmonia Orchestra played with a saturated but controlled sound that was nimble enough to turn on a dime between rhapsodic despair and terrifying cacophony, as in Marie’s scene in Act III. As unrelenting as they were throughout the evening, the Philharmonia reached a whole new level in Act III. 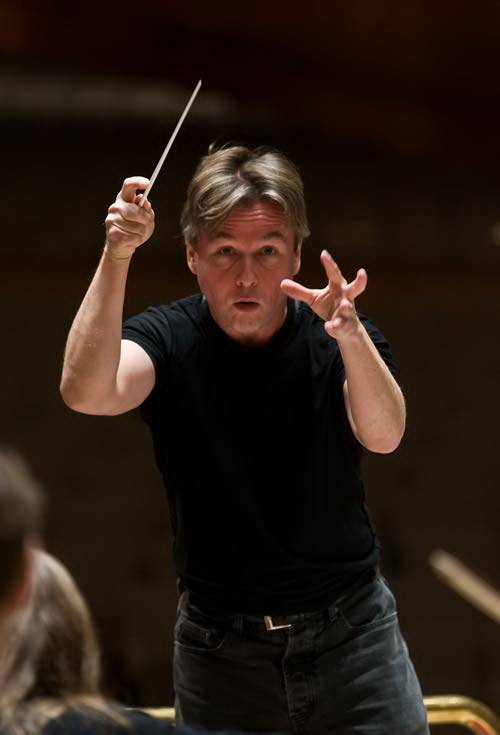 In the interlude before the second scene, Salonen drove the orchestra in a manic accelerando that left the hall dead silent in anticipation of the coming tragedy. The brass response to Marie’s murder was as raw and visceral as could be imagined. Salonen was in complete control of the score, which was no surprise. What remains surprising, however, is just how spontaneous his performances still sound through all the years. As anticipated, this performance was indeed a special event, and given the audience’s raucous reaction, one we all felt fortunate to witness.